Save $$$ on energy consumption, the Rhino GSP are proven and tested the lowest energy usage on world market, nearest competitors are over 2 times more expensive to run. 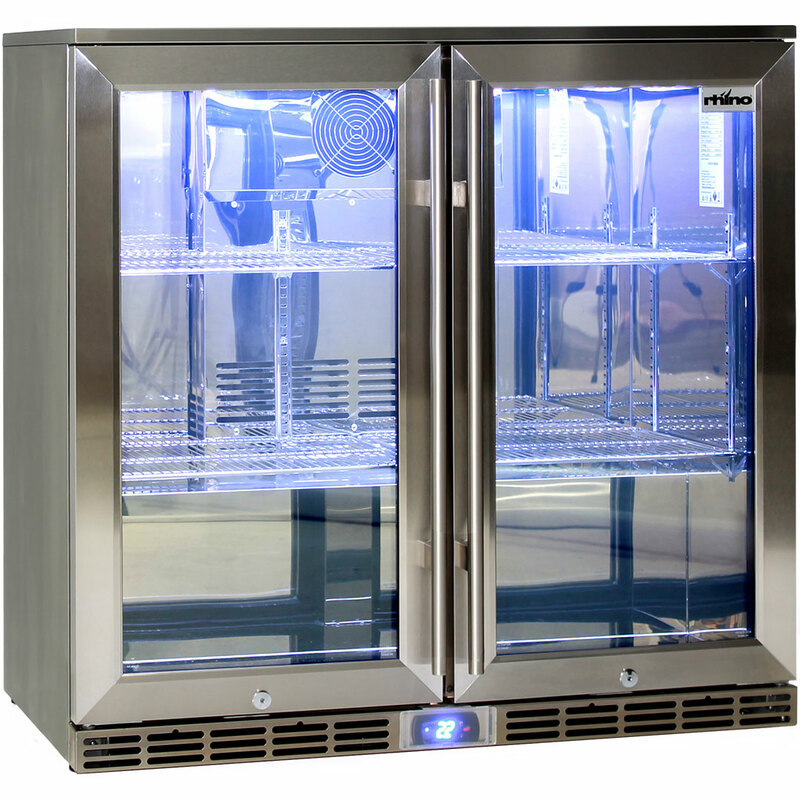 These alfresco outdoor bar refrigerators took us 3 years to develop starting in 2008. They encompass the best brand name parts available in the world, the best engineers and a long standing manufacturer, to bring to Australia the most economical well performed on the market, similar brand name units simply do not keep drinks cold once temperature gets to about 28°C +. You will notice on the ‘Feefo’ Independent reviews noise is mentioned as a downfall, we just want you to know that we have since addressed this issue with special quieter German interior ones that are now 39Db, and not the Std 55Db, the total unit Db is now 47Db, we cannot change the rear one to be much quieter when being used in alfresco without compromising a little in run times and energy consumption. If unit going inside we can alter rear to a quiet blade making a few Db difference to app. 43Db. Alfresco, Under Bench, Under Counter “RHINO“ “GREEN SENSE PLUS” glass door outside bar fridge, Eco Friendly, Energy Saving industrial type for heavy usage and reliability indoors and out. The only proper choice for outside use and a great for busy pubs with fast pull down times and cheapest units to run on Australian market. 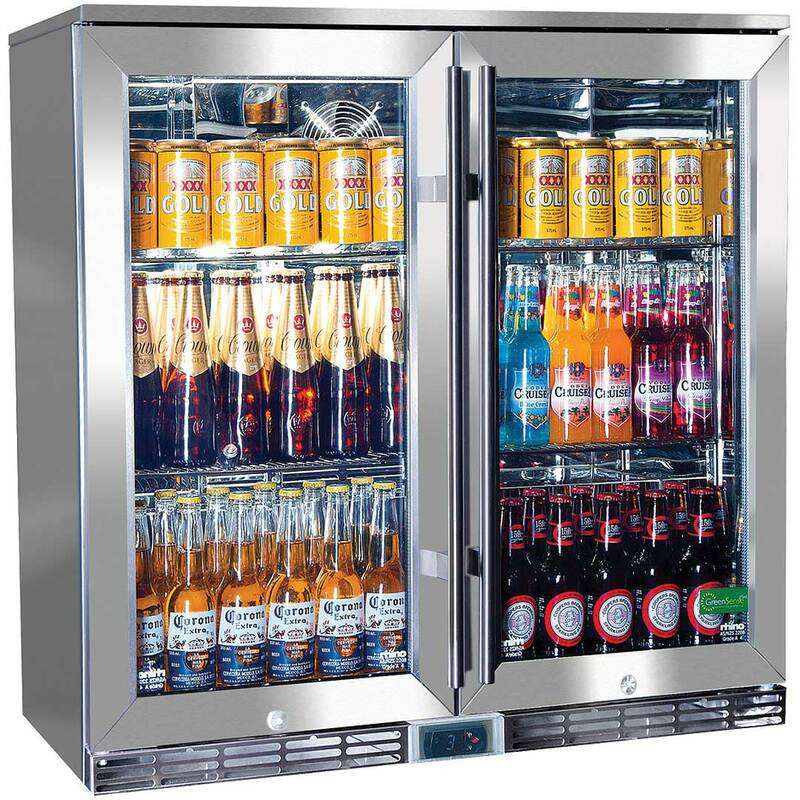 Industrial build for harsh applications, especially Alfresco areas and busy pubs and clubs, units are IP34 rated so are a proper outdoor rated product, no other fridges on our market have had this test done. Power Consumption: 1.65Kwh/24Hr And 1.27KWh/24Hr in ECO mode. Some of our previous models and most others on market draw up to 5.9KWh/24Hrs, its over 3 times cheaper to run. Size: W: 900mm x D: 500mm x H: 865mm (available in 840mm high version Model GSP2H-840-SS), allow 5mm each end for door swing if fitting in cabinetry. Db (Decibal rating 47), commercial grade fridge, you can hear these running.. We do special quiet fan upgrades if you want to use inside, this is extremely popular, ask the staff about this, dropping inner fans to 39Db and rear to app 43Db. Chills to 2ºC with ease in 40ºC+ heat. This is tested and works in that temp, not just tested in that temp. Many competitors don’t give results of harsh testing. 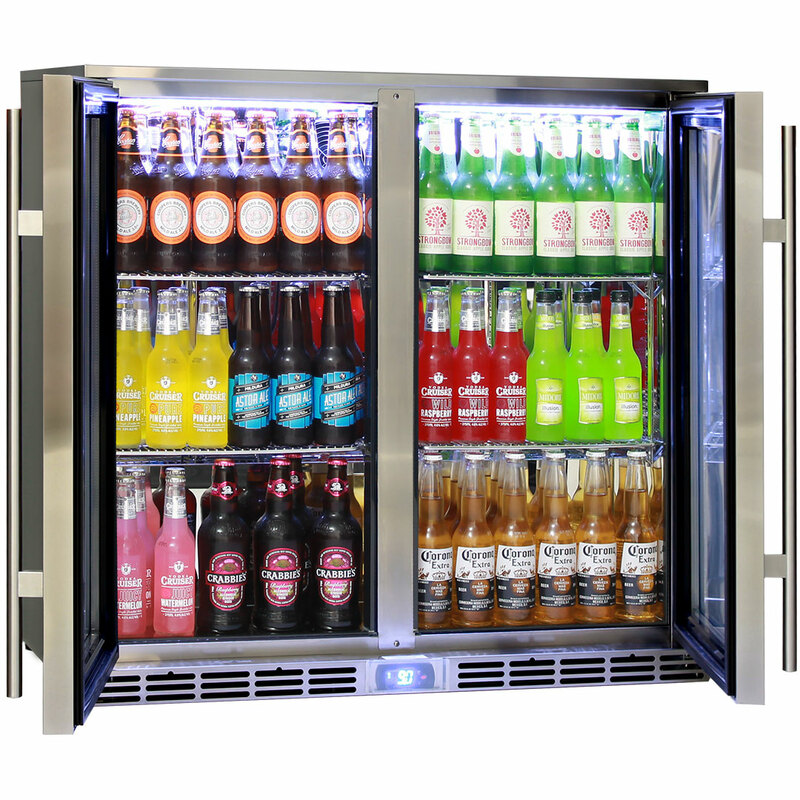 Industrial style for harsh applications, great pub or outdoor bar fridge. Specially designed to be placed inside cabinets 100%, front venting units so no ventilation needed. Double glazed tempered self closing lockable doors. All fans are from Germany’s best manufacturer, EBM, utilizing the ‘EC range’ that run 70% cheaper than other fans. Quality Embraco compressor from Spain using R600A refrigerant (100% ozone friendly), running 25% cheaper than similar. Automatic “Carel” eco controller from Italy has two modes, one for extra cold drinks when needed to operate at a premium and ‘Eco’ mode for periods of non usage to save plenty of power, up to 30% more. 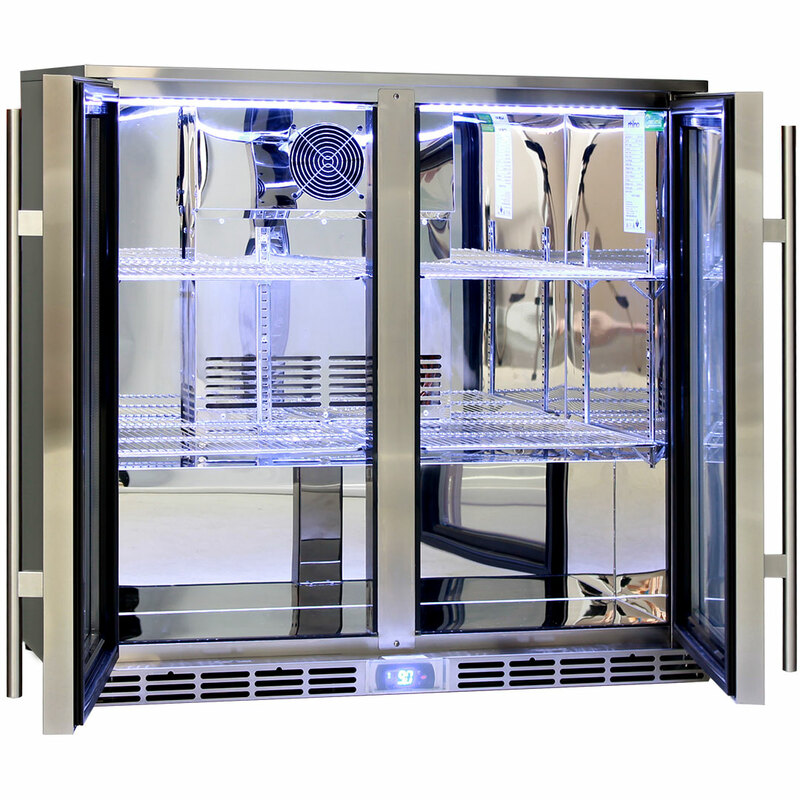 Patented air flow system allows unit to quickly get to temperature, saving run times, energy consumption and protecting all working parts to extend life of the fridge. Recently awarded by Heineken “Most valuable Ozone Friendly Supplier” and “Most Energy Efficient Units In Their Class In The World”, (see download section for more). Tested at TUV Rheinland laboratory’s, these rated the most energy efficient units within their class in the world. Double LOW E glass panels can handle up to 77% humidity in 40ºC and 73% in 30ºCwith no condensation (no water on your hard wood floors). Heated mullion (part where doors meet body, stop condensation and water forming). Allow 10mm shadowline when building into cabinetry. Handle protrudes 45mm extra than depth of 500mm. 12 x shelf adjustments are 25mm apart. Step in fridge is 210mm from front, 200mm high and 150mm deep. 2 years parts and labour 5 years compressor warranty included.